Otis Chandler, William Harrah, Henry Austin Clark, Jr. and Bruce Weiner share a thread with Jerry Seinfeld. They elevated car collecting to a high level. Chandler worked his way through collecting genres from American Muscle through motorcycles to grand Classics, each time doing his research, enlisting the best specialists and exercising a common characteristic shared with the others called ‘taste’. Bill Harrah was eclectic, yet the staff he assembled and the standards he had them follow makes ‘Harrah’s restoration’ still a standard for careful, thorough research and a wide-ranging search for the best. Austie Clark never met a vehicle he didn’t like, and he drove them with a verve and style rarely duplicated while preserving relics that form the Genesis of the automobile and without which our automotive history would be sadly shallow. Bruce Weiner loved (and still loves) microcars, making their documentation a signature of his collection. Add Jerry Seinfeld, who sold 18 cars in the headline collection at this year’s Gooding & Company Amelia Island Auction, to that list. He may (and probably does) own rats, but they weren’t among his collection-thinning offering in Amelia. His reputation as a discerning collector of the finest cars from Porsche is well-established. He has honed his understanding of Porsche, augmenting it with advice from recognized experts, to a high level, imparting ‘Ex-Seinfeld Collection’ provenance to every Porsche (or VW) he owns. They are the best. And they were presented that way, pristine, fresh and crisp according to their histories. The Gooding Amelia Island marquee was a panoply of Porsche shirts as the Stuttgart faithful gathered to the time and place to witness a display even more Porsche-centric than Gooding’s offering here of the Drendel collection of turbocharged Porsches in 2012. The place was packed to the walls. Celebrity doesn’t hurt, either, and every successful buyer got a photo (in some cases a very expensive photo) together with the car and Jerry Seinfeld. The sale’s headline car, Ferrari 250 GT SWB California Spyder s/n 2871GT was almost an afterthought, selling for a within-estimate $17,160,000 late in the sale. At the end of the day the Seinfeld cars and the Cal Spyder made this, by almost a factor of two, Gooding’s most successful Amelia Island auction, with $60,179,350 changing hands. Andrew Newton contributed many of the on-site observations; the editor remains responsible for the final content and observations. 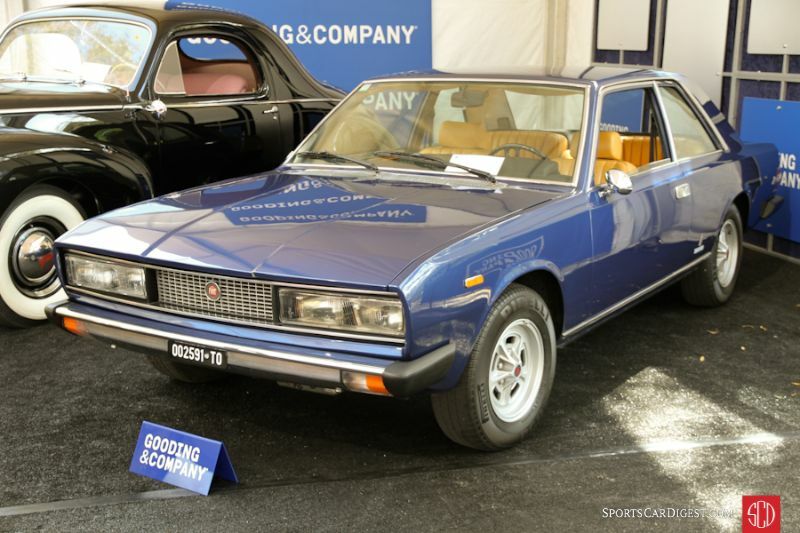 Lot # 03 1973 Fiat 130 Coupe, Body by Pininfarina; S/N 130BC0002591; Blue/Beige leather; Estimate $40,000 – $60,000; Cosmetic restoration, 2- condition; No Reserve; Hammered Sold at $27,000 plus commission of 10.00%; Final Price $29,700 – 3235cc/165hp V6, Cromodora alloy wheels, Pirelli tires, single twin-choke Weber, ZF 5-speed, Audiovox cassette stereo, power windows, dash clock. – Lightly scratched mirrors. Trunk is not flush. Fairly worn but sound upholstery. The rest of the interior is very good. Cosmetically restored years ago, then imported from Italy in 2012 and recently serviced, including a new clutch. Not Pininfarina’s most elegant design, but a neat car that’s rare in Europe and almost unknown in the US. – An intriguing car with typical 70’s Italian coachwork, powered by a 60 degree V-6, but a different engine from the Dinos. It’s always going to attract modest attention but its coachwork is mundane and 165hp (German DIN rating) doesn’t make it much of a performer today although in 1973 it was notable. The result shows the bidders’ indifference to it. As a conversation piece it has value, and it should drive reasonably well with 4-wheel independent suspension and the 5-speed. In the end, though, no one much cares. 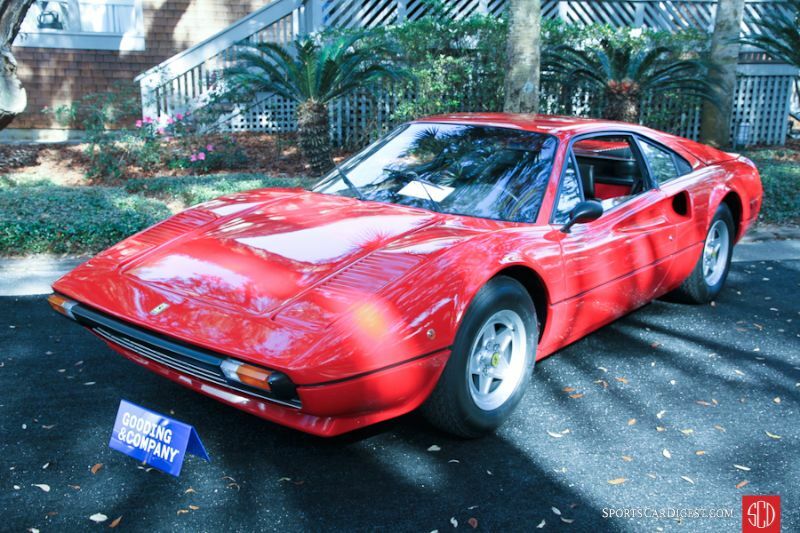 Lot # 05 1976 Ferrari 308 GTB Vetroresina Coupe, Body by Scaglietti; S/N 19145; Rosso Corsa/Black leather; Estimate $275,000 – $325,000; Visually maintained, largely original, 2- condition; With Reserve; Hammered Sold at $215,000 plus commission of 10.00%; Final Price $236,500 – Fiberglass body, quadruple Webers, dry sump, Campagnolo wheels, Michelin XWX tires, power windows, Borletti air conditioning, cassette stereo, Grey market import approvals, owner’s manual, tool roll. – Represented with original paint and interior. Very good paint and bumper plastic. Dull, foggy wheel caps. Fairly worn but good upholstery. Sold new in Italy before making its way to Florida, where it was fitted with a US speedometer/odometer, which now shows 45,701 miles. Serviced extensively last year. – This is no ordinary 308, as this transaction shows. The early carbureted, dry sump lubricated fiberglass cars command a significant premium, and this one’s impressive level of preservation in addition to the concentration of wealth in the room explain the big result, one that’s expensive but not excessive. 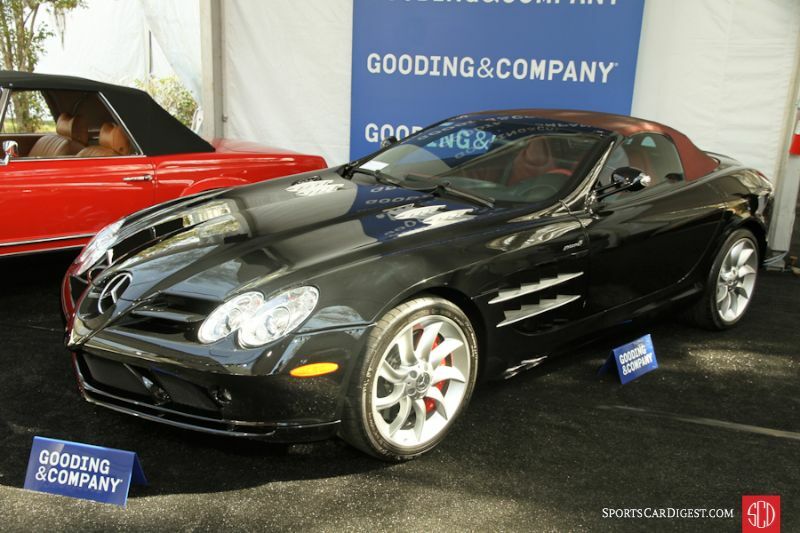 Lot # 07 2008 Mercedes-Benz SLR McLaren Roadster; S/N WDDAK76F18M001557; Pure Black/Red leather; Burgundy cloth top; Estimate $360,000 – $425,000; Unrestored original, 2 condition; With Reserve; Hammered Sold at $360,000 plus commission of 10.00%; Final Price $396,000 – 5.4/617hp supercharged V8, 5-speed paddle shift automatic, Michelin Pilot Sport tires, carbon ceramic brakes, red calipers, power windows, climate control, factory radio, CarFax documented. – One of 106 2008 Roadsters. Two owners. Like new with 2,000 miles and recently serviced. – This was a half-million dollar car when new, so this transaction still shows used car depreciation on a used car. The buyer would prefer it be considered a future classic. 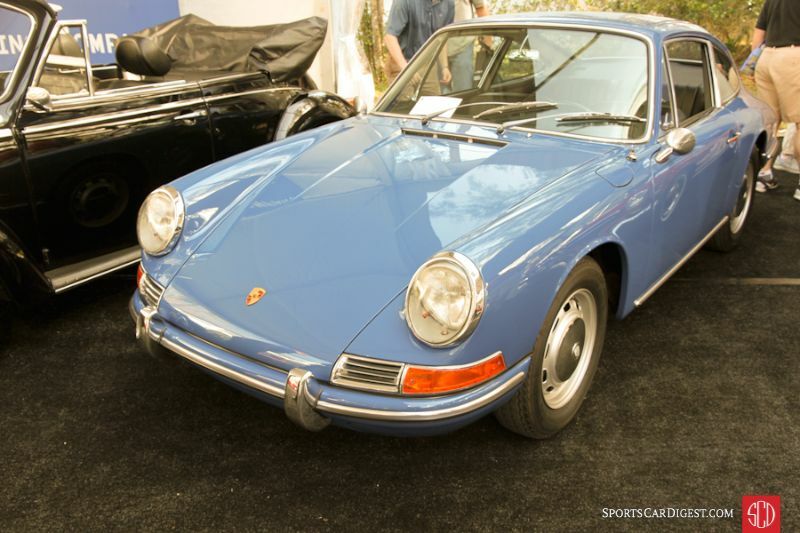 Lot # 09 1966 Porsche 912 Coupe; S/N 353326; Gulf Blue/Black vinyl; Estimate $60,000 – $80,000; Older restoration, 2 condition; No Reserve; Hammered Sold at $60,000 plus commission of 10.00%; Final Price $66,000 – 1582/102hp, dual Solex carbs, 5-speed, steel wheels with hub caps, Vredestein tires, dual mirrors, Simpson lap belts, Blaupunkt AM/FM pushbutton radio, Koni suspension, Cibie headlights. – Very clean, like new engine bay. Very good paint. Excellent interior. Fully restored in 1990, but looks to have been done much more recently and showing no flaw other than very light general age. – Sold by Gooding in Scottsdale last year for $82,500. That was a monumental price at the time for a 912, and while this result only a year later is still expensive, it’s sign of Porsche-mania settling down. The Gooding bidders were probably keeping their powder dry in anticipation of the Jerry Seinfeld Porsches coming across the block an hour or so later. Sometimes it’s good to be a buyer with the courage to stand up for your convictions and not wait for the star cars. 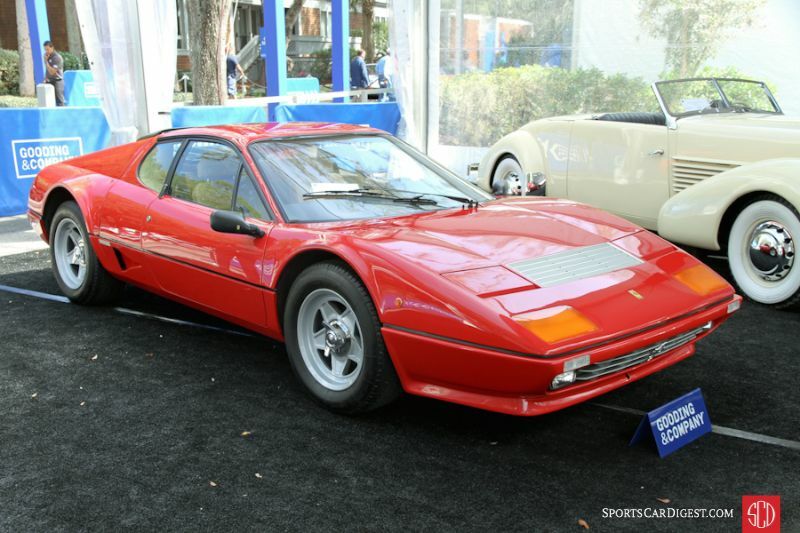 Lot # 12 1984 Ferrari 512 BBi Berlinetta, Body by Pininfarina; S/N ZFFJA09B000047867; Rosso Corsa/Beige leather; Estimate $300,000 – $350,000; Unrestored original, 2 condition; With Reserve; Hammered Sold at $270,000 plus commission of 10.00%; Final Price $297,000 – Centerlock wheels, Michelin X tires, power windows, air conditioning, Momo steering wheel, Pioneer cassette stereo, Grey market approvals, complete tool roll, manuals, original stereo. – Recent engine-out service on belts, valve adjustment, clutch, hoses and cooling system. Tiny, tiny chip on the nose. Signs of light use and dirt underneath. Very good original paint. Very lightly worn interior. Bought new in Los Angeles by actress Kirstie Alley for husband Parker Stevenson. A babied Ferrari with no stories and 9,057 miles. The kind of car to buy. – Berlinetta Boxers have been consistently cutting new records and it is therefore surprising that this low miles, documented, ex-[minor]celebrity owned BBi didn’t bring more. Its history makes it a good, but not excessive, value at this price. Lot # 14 1964 Shelby Cobra 289 Roadster; S/N CSX2433; Dark Blue/Black leather; Estimate $950,000 – $1,100,000; Competition restoration, 2+ condition; With Reserve; Hammered Sold at $1,200,000 plus commission of 10.00%; Final Price $1,320,000 – Wide hip body, dark grey Halibrand style centerlock alloy wheels, braced paperclip rollbar, fire system, SW gauges, black side exhausts, quick jack pickups, no bumpers, four Webers, Le Mans style hardtop, quick release fuel cap. 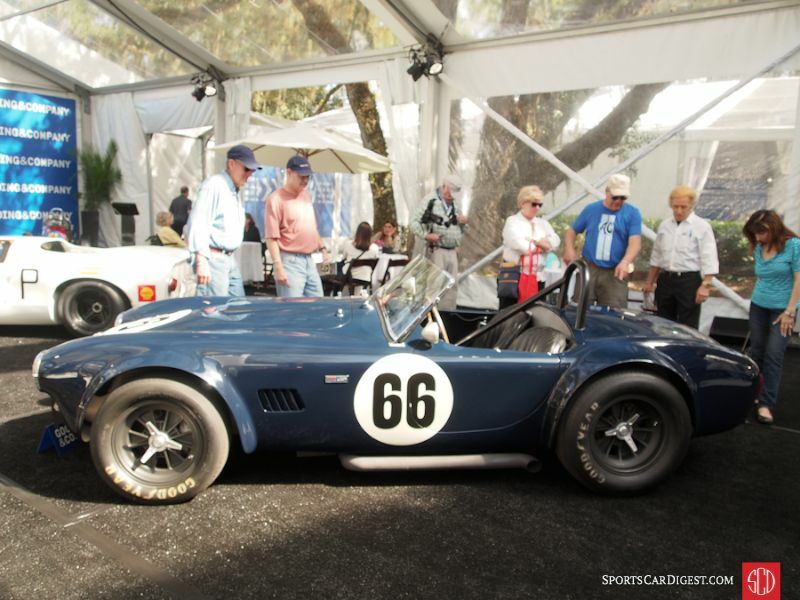 – Raced when new and restored in competition Cobra configuration by Bruce Canepa in 2012. Fresh, shiny recent paint, good older upholstery, sharp, clean like new engine compartment. A highly developed, powerful Cobra less intended for show than for go. – An endorphin eliciting Cobra not for the faint of heart or the unskilled, calculated and intended to be driven hard in competition events. There is no presumption of originality here, just purpose, which it has in abundance. Its price is as enthusiastic as the Cobra. 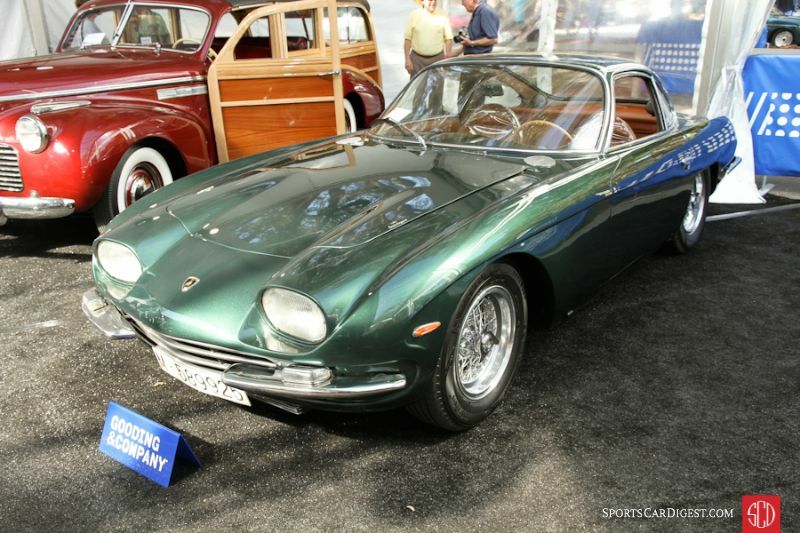 Lot # 16 1965 Lamborghini 350GT Coupe, Body by Touring; S/N 0343; Engine # 274; Metallic Green/Brown leather; Estimate $650,000 – $750,000; Visually maintained, largely original, 3 condition; With Reserve; Not sold at Hammer bid of $600,000 – Borrani wire wheels, Michelin Defender tires, woodrim steering wheel, power windows, Panasonic cassette stereo. – Represented as matching numbers. In Madrid for most of its life before going to Isao Noritake’s collection in Japan. Dull bumpers with deplating in a few spots. Very good repaint. Clean and tidy and original underneath. Originally painted Argento Metallizzato. Painted over stress cracks and a small dent at the back of the hood. Dull grille. Crack at the bottom of the hood. Touch up at the back of the driver’s door. Worn but sound original upholstery and switchgear. The first production Lamborghini model, of which 120 were built. A complete, mostly original car aside from an old respray, showing 97,220 km and age that could easily be lived with. – Not sold? Why not? This is a tired Lambo and no one could possibly parse its value within 7.7% of the low estimate. If there was money at the reported high bid it should have gone away. 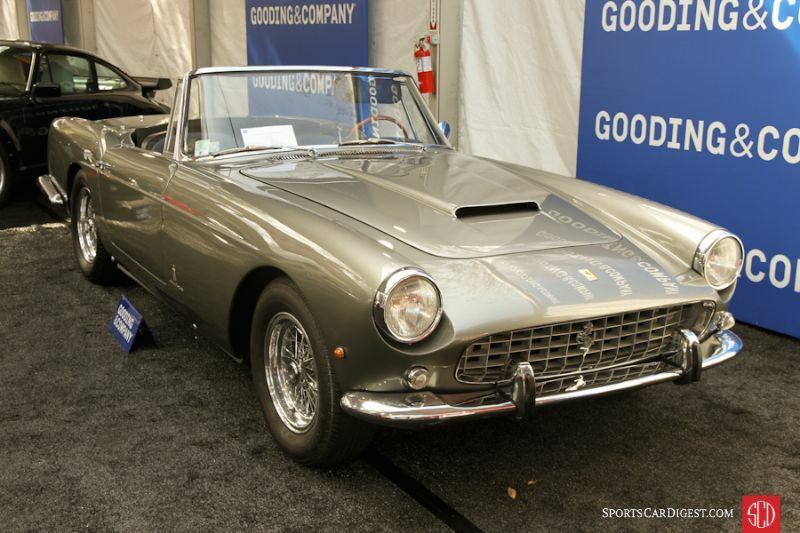 Lot # 20 1960 Ferrari 250 GT Cabriolet Series II, Body by Pinin Farina; S/N 1695GT; Engine # 1695GT; Grigio Scuro/Black leather; Black cloth top; Estimate $1,500,000 – $1,800,000; Cosmetic restoration, 3 condition; With Reserve; Hammered Sold at $1,375,000 plus commission of 10.00%; Final Price $1,512,500 – Triple Webers, Ansa exhaust, Borrani wire wheels, Falken tires, woodrim steering wheel. – Fourth of 200 built. Exhibited at Geneva in 1960 with nineteen subsequent owners. Originally finished in Verde Scuro over tan leather. Represented as matching numbers. Plating is flaking off of the wheel lobes. Doors aren’t flush. Old Falken tires, and probably should have Michelins on it. Lightly scratched chrome. A few small bubbles on the nose. Orange peel on the tail. Quite worn upholstery. It is in basic driver condition. Inherently cool and collectible for what it is, but in unremarkable older cosmetically restored condition. – Sold for $120,868 at Brooks all-Ferrari auction in Gstaad in 1999 in its original livery, repainted shortly thereafter and essentially left alone since then. It may have many needs, but most of all it needs to be mechanically serviced and then driven a while to take advantage of its condition. At this price that is an entirely reasonable proposition and both the seller and the buyer should be satisfied with the transaction’s result. Thanks Rick for another well written article! All those Porsches and ’70s–’80s Ferraris make for a really dull article and probably auction too–unless you were just Porsche crazy. Didn’t Gooding sell anything else? Rick, I’m always grateful fo your fascinating reports and the understanding you provide of the auction market. And have never disagreed with your taste…until your negativity towards the Fiat 130 Coupe! That is a very fine bit of Pininfarina design, subtle and classy like a nice Italian suit. I hope you can take a look at one sometime in isolation, and gain an appreciation for its beauty. Thanks for all that you share with us, John in CT.
Dead right, John. I’ve always admired the Fiat 130 so much I took Rick’s slight about its design very badly. Couldn’t see what he was talking about. In my book the 130 has always been and will always be a great looker…!! !